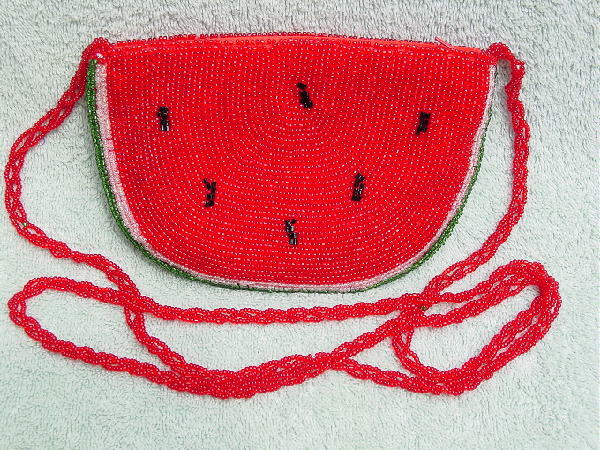 This beaded purse is in the shape of a slice of watermelon. The center section is in tiny red beads with six seeds in black beads. The rind is in clear beads and the skin is in dark green beads. The lining is done in red fabric. There is a top side to side zipper and a loosely braided three strands of beads which form the 47 1/2" long shoulder strap. It's from a stylist's inventory, and was used in a magazine photo shoot.